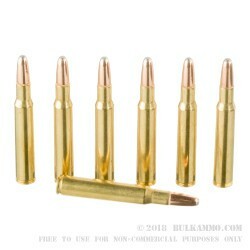 When you need the bullet mass to ensure a very large game animal is stopped, this is a solid contender for your hunt. 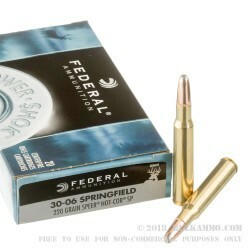 The 220 grain Speer Hot-Cor soft point projectile that travels at 2400 feet per second and delivers 2810 ft. lbs. of energy at the barrel is enough to handle the largest game in North America with very few exceptions. 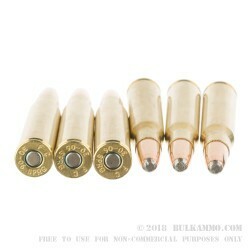 The soft point, and ballistic coefficient makes this suitable for heavier cover than the standard bullet designs, to minimize brush deflection and deliver on target at ranges that might be closer than 200 yards. A large mass of lead with great weight retention and very good background ballistics means you can be confident that you have selected the right round when weather, terrain, or other concerns hamper your chances of making a perfect shot. There is a lot of forgiveness in this design and the price is suitably adjusted for that. 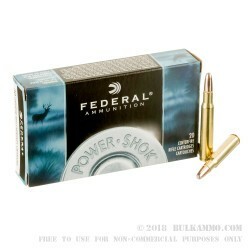 The versatility you get with the Federal 220 grain .30-06 load is a great failsafe for when you know there will be challenges and you still need a round that can step up and face the challenge so you walk away from your trophy hunt with a trophy.